One of MPT's most beloved on-air personalities, Jean Reese Worthley ("Miss Jean"), died April 9, 2017 at the age of 92. 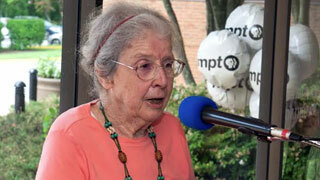 Prior to her television career, Jean Worthley was a well-known Maryland naturalist. She began her time with MPT in June 1969 while the station offices were still located downtown on St. Paul Street. As was noted during the 2013 ceremony when her star was unveiled on the MPT Walk of Fame, later on Miss Jean and her parrot, Aurora, would walk to work at the then-named Maryland Center for Public Broadcasting in Owings Mills from her nearby home. Miss Jean's series was instrumental in bringing the wonders of nature to children who didn't usually have the opportunity to explore it. It's said she taught with a gentle outlook and inquisitive spirit. Each week, HodgePodge Lodge featured a different aspect of nature, from pine cones to groundhogs. It was said that Miss Jean was "sort of like a naturalist Mr. Rogers" with her quiet demeanor and kind way. In fact, she appeared on Mister Rogers' Neighborhood in 1975, too. 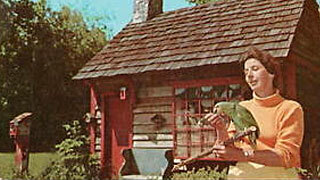 Besides serving as host of HodgePodge Lodge, she was co-host of On Nature's Trail, a 26-episode show produced by MPT in 1977-78. It featured Miss Jean and her husband, Elmer, observing and discussing plants growing at different locations in Baltimore County during the spring, summer and fall. Miss Jean also was author of The Complete Family Nature Guide which was published in 1976. Earlier in her life, Miss Jean was a 4-H leader and a guide and teacher for a nature camp sponsored by the Federated Garden Clubs of Maryland, according to a longtime friend. Miss Jean's legacy lives on in the memories of children as well as her MPT colleagues.